The Savoy Hotel opened its doors on March 30th, 1913. Its has been raised on demand of the Salamander Fire Insurance Company, which has redeemed the princess Argamakova-Turkestanova’s estate at the corner of Rozhdestvenka and Pushechnaya Streets. Argamakovs aristocratic family was known long before 18-th century as strong and devoted supporters of the Russian throne and was related to a well-known Russian playwright Denis Fonvizin. 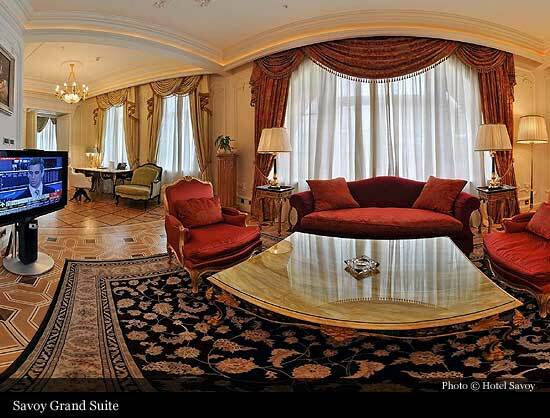 Established in 1846, The Salamander was the third biggest insurance company in Russia at that time. 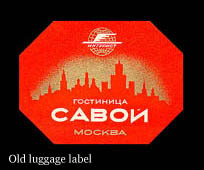 Its motto "On Fire and Still not Burned Out", was invented by a writer Alexey Pogorelsky. A salamander, that according to mythology is a small lizard living in flame, also became a symbol of the Savoy. 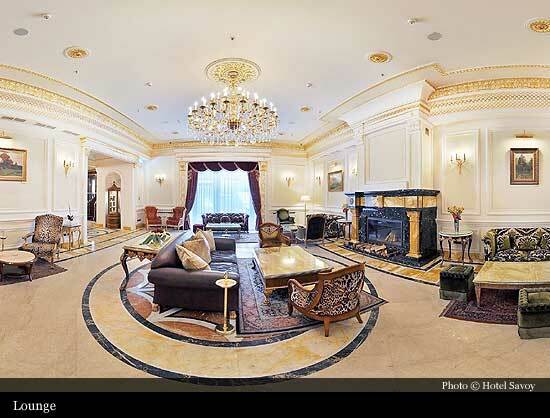 Now everyone can meet its image in sumptuous stucco molding, on carpets, in mosaic on the swimming pool’s bottom. 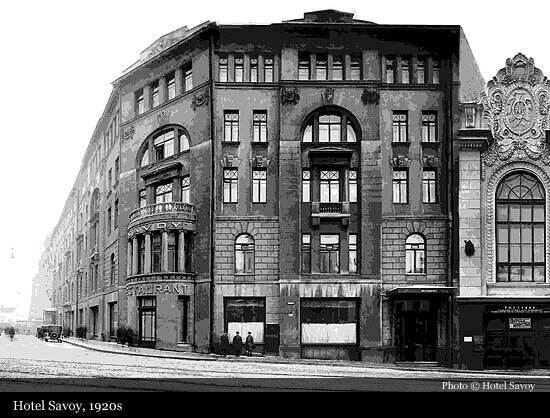 The Salamander planned to open a new hotel with a café on the first floor in its newly acquired property and decided to name the hotel Savoy, probably referring to the Savoy Alps. The Savoy Duchy in the French Alps conveys an idea of splendor and richnes and was famous for magnificence of castles and untold wealth of their aristocratic owners. 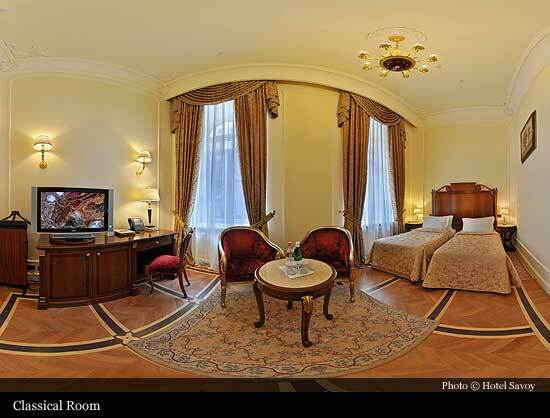 Renovation of the building started in 1911 and was supervised by the architect Victor Velichkin. While working at the project, the architect has turned to empire; this neoclassical style was extremely popular in Moscow that celebrated the anniversary year of a Patriotic War’s victory. 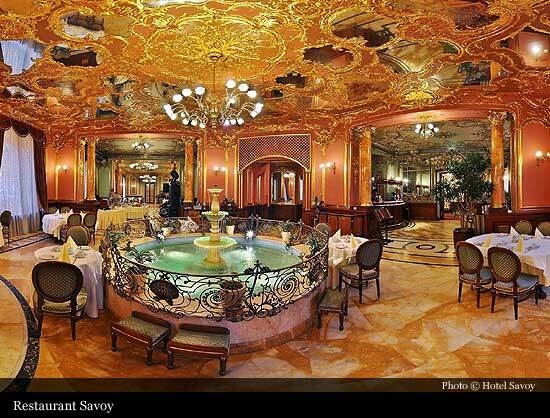 Sumptuous interiors of Savoy restaurant were designed in rococo aesthetics, and this design concept is still lasting out. 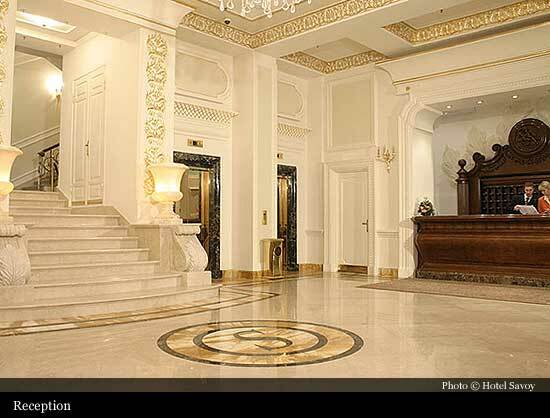 From the very first days the hotel Savoy, featuring the latest facilities, embodied luxury and comfort. 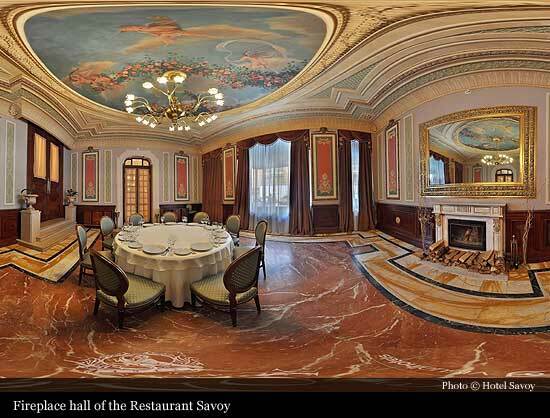 In March 1913 the Savoy Hotel was officially opened with a grand banquet to celebrate the event, while the Savoy restaurant, initially called Savoy French café, opened eight months later. 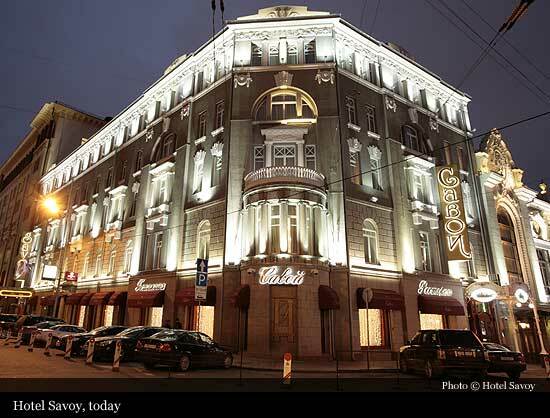 After the revolution of 1917, Savoy came under the control of the Moscow Council hotel administration. 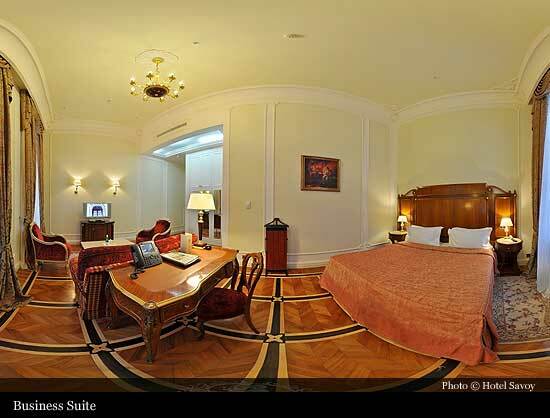 By 1930 along with the Metropol and the National, it was incorporated into the Hotel All-Union Company, established to provide services for foreigners. 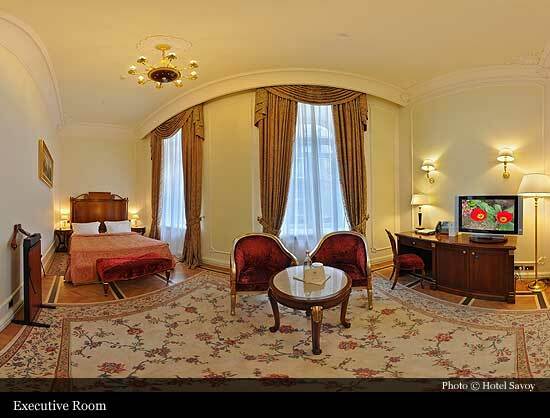 From 1958 to 1989, the Hotel became a part of Intourist system and was renamed into "Berlin Hotel". 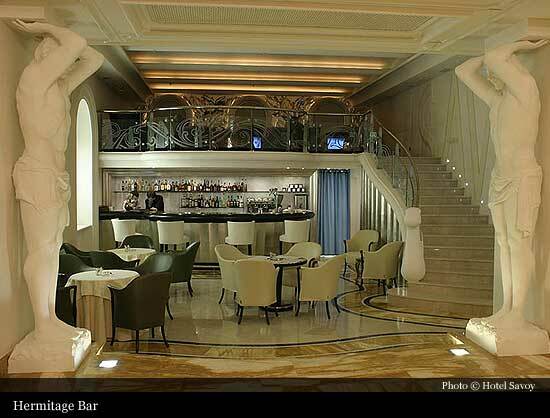 Then after profound reconstruction of 1989 it got back its historical interiors and the original name. Savoy welcomed world famous celebrities, names which are the best recommendation for the Savoy: Luciano Pavarotti, Jose Carreras, Lucia Aliberti, Montserrat Caballe, Dmitry Khvorostovsky, Marti Ahti Saari, Sadako Ogata, Ernst Neizvestny, Richard Gere, Jane Fonda, Cindy Crawford, Ted Turner, Patricia Kaas and many others.